Are you feeling tired and bored of the usual routine for a day? Well with the popularity of You Tube personalities right now, there were also another duo that we can check and brings us various experience day in and day out. YouTube’s popular personalities Ranz & Niana will shake up your day with the Truffle Shuffle Dance. 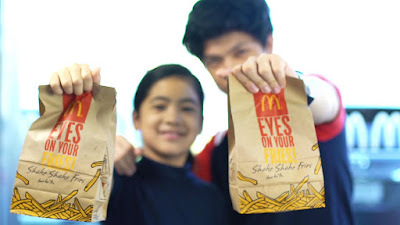 Watch them show off their latest dance moves together with their new favorite snack, McDonald’s Creamy Truffle Shake Shake Fries. This video currently has over 600k views on YouTube and close to 1.5 million views on Facebook. Like this dynamic duo, make every day a trufflin’ shufflin’ day when you try out the new Creamy Truffle Shake Shake Fries. Its rich and savory truffle flavor, balanced with a hint of creamy cheese and chives, will have you busting out your best moves.